Risa L. Lieberwitz, Professor of Labor and Employment Law at Cornell University and General Counsel of the American Association of University Professors, will visit WMU on Friday, September 16. 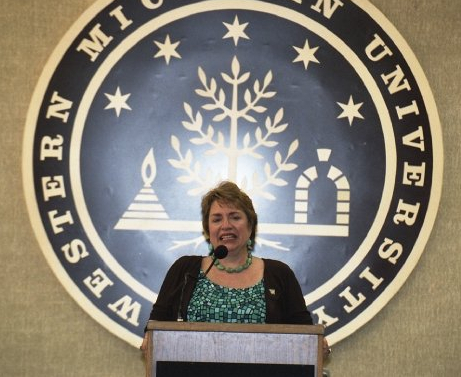 She will be the featured speaker at the WMU-AAUP New Faculty and Association Council Luncheon at 11:30 a.m. and later on the 16th will present “The History, Uses, and Abuses of Title IX” in a public presentation at 4 p.m. Both events will be in 157 Bernhard. Professor Lieberwitz chaired the committee that produced the new AAUP report on the history and current uses of Title IX, a joint project of the AAUP’s Committee A on Academic Freedom and Tenure and the Committee on Women in the Academic Profession. The report identifies tensions between current interpretations of Title IX and the academic freedom essential for campus life to thrive. It finds that questions of free speech and academic freedom have been ignored in recent positions taken by the Office for Civil Rights (OCR) of the Department of Education, which is charged with implementing Title IX, and by university administrators who are expected to oversee compliance measures. Thursday, February 4, 3:30 p.m. 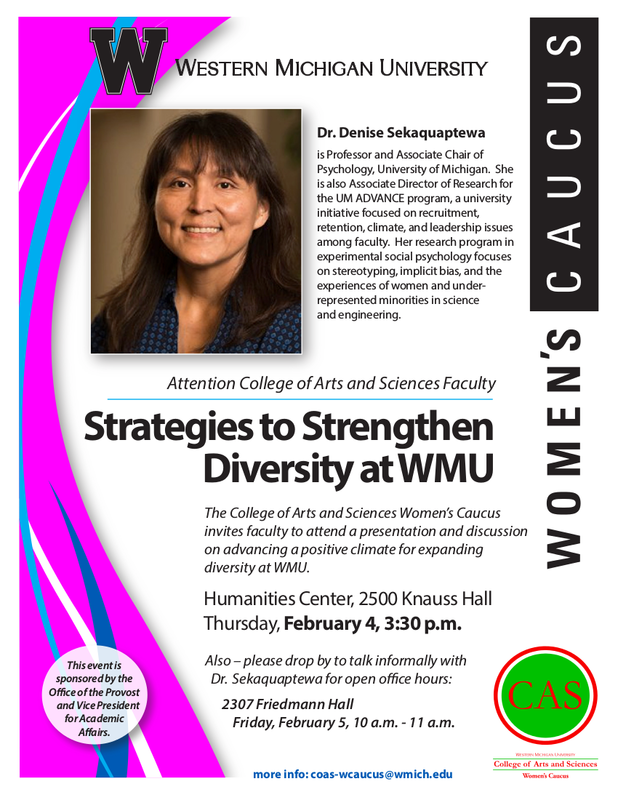 The Women’s Caucus of the College of Arts and Sciences invites all WMU faculty to a presentation and discussion on advancing a positive climate for expanding diversity at WMU. Dr. Denise Sekaquaptwa, University of Michigan Professor of Psychology, will speak Thursday afternoon and hold open office hours for informal conversations on Friday, February 5, 10-11 a.m. in 2307 Friedmann. For more information, contact the CAS Women’s Caucus at coas-wcaucus@wmich.edu. The CAS Women’s Caucus will host a brown bag lunch gathering for Women Faculty of Color on Wednesday, December 2, from 12 noon to 1:30 p.m. in the WMU Center for the Humanities (2500 Knauss Hall). This gathering is open to all WMU women faculty of color in all colleges. In addition to networking, we will share information about the Faculty Women of Color in the Academy National Conference in Champaign, IL, April 1-2, 2016, and explain how the CAS Women’s Caucus will support colleagues to attend this conference. Come to network and to share your input on issues facing women faculty of color at WMU. We are planning a speaker visit in spring 2016 and your input will shape the focus of that visit. For more information, contact Dr. Chien-Juh Gu, Associate Professor of Sociology. Call (269) 387-5243 or email chien-juh.gu@wmich.edu. Faculty who were not able to attend the WMU-AAUP chapter meeting on April 17 with special guests President John Dunn and Trustee Mary Asmonga-Knapp were invited to submit their questions electronically, as were colleagues who did attend but preferred to submit their questions in advance. When time did not permit coverage of these questions at the meeting, Trustee Asmonga-Knapp asked to take the list of questions with her so that she could respond to them in writing. Additionally, several faculty members followed up with questions after the chapter meeting. Her responses to the questions posed online and after the meeting appear below. On behalf of the WMU-AAUP bargaining-unit faculty, we express our thanks to President Dunn and Trustee Asmonga-Knapp for their attendance at the meeting and to Trustee Asmonga-Knapp for taking the additional time to respond to the questions that were not addressed during the meeting. Trustee Asmonga-Knapp asks that readers please note that the viewpoints expressed here are her own and that she is not speaking for the Board. Question: Is Trustee Asmonga-Knapp aware of how much her visible support of gender equity has meant to women faculty and staff at WMU? When I moved to table the motion for the President’s compensation package at the March 2015 meeting of the Board of Trustees, I knew I would not have any support from my colleagues on the Board. I could not in good conscience vote yes to the compensation package, when as far back as 2011, the administration knew there were significant issues regarding pay equity for women faculty and our administrative professional staff and clerical workers who were predominantly women. The trustees were notified in 2014 that there were pay equity issues, but prior to that we had heard nothing. When protests began campus wide, I pressed for resolution and wondered how long it would take to determine pay scales. Years? After the January meeting of the Board of Trustees at the Bernhard Center, and dissent became widespread, suddenly a preliminary report from Aon Hewitt surfaced. It was at this time I realized the gravity in pay differentials. As a working woman, wife and mother, I have lived their story. I know exactly what gender inequity feels like. It not only reflects tangibles in dollars and cents, but it also involves being treated as if you do not have a voice or a worthy thought even though you spend most of your time doing the hard work and making sacrifices for the organization. People are more than a budget line item. Professors, clerical workers, stage hands, teaching assistants, grounds persons, cafeteria workers, academic professionals, and a whole host of working Michiganders are the reason WMU works. I have lived your story. Seeing you all in the audience at the recent meetings gave me guts and purpose! I now know why I sit on the WMU Board of Trustees. It is YOU who gave me the courage to stand. I thank you. We need to take care of “First things first.“ Those lower paid administrative and clerical staff should have come before such a generous presidential contract and retirement package, which could have been addressed after their needs were met. It did not send a message of caring or concern. We need to take care of the troops first. I thank those staff for their years of hard work and light pay. Question: Has there been any follow up from other trustees that Trustee Asmonga-Knapp is in a position to discuss indicating their new willingness to work on gender equity concerns with her? To my knowledge, other than myself, no member of the WMU Board of Trustees acknowledges any gender equity issues, whether tangible or intangible. They also do not seem willing to acknowledge the existence of a morale problem among faculty or other staff. We need to improve these relationships and work toward a healthier work environment. These conditions need to be acknowledged, and they are clear if we review the faculty surveys of the last few years. However, the tendency is for the issues to be ignored and blamed on a few rabble rousers. Question: Can Trustee Asmonga-Knapp provide insight as to why there were police officers at the March 25th meeting of the Board of Trustees and why the April BoT meeting will be held out of town? Isn’t the campus enthusiasm to be at these meetings a good thing? I think there were police officers at the meeting because the status quo felt threatened. Dissent can be frightening for some. I do not know who called the police, but I did not find the event threatening. If we cannot have dialogue on a university campus, where can we? I hope we have lots more. Question: Is there anything that faculty can do to support your continued efforts on our behalf? Being a woman of faith, I ask you to pray for me. I ask you to send me emails, call me, and continue to educate me. The short time I have left on the Board of Trustees, let it be used for good. I ask you to speak up at meetings, send letters to the Board of Trustees and let your voices be heard! Write articles. Keep talking. I want you to enter into discourse with President Dunn and work through these very painful issues collectively. Can we do better? YES WE CAN! Question: In 2006 WMU subsidized NCAA Division 1 programming to the tune of $8 million. That is $8 million spent to balance the books after all income is taken into account. In 2013 that number was up to $18.5 million. What does it say about our priorities when we are willing slow or freeze faculty hiring, decrease the number of GA/DA lines, and increase student tuition under the guise of budget cuts when the NCAA subsidy (loss) has more than doubled in the last 7 years? It is disheartening when so much is spent on NCAA Division 1 programming and an assistant professor gets offered $38,000, as one faculty member mentioned at the chapter meeting. I could not have survived on that salary. However, it is looked upon as an investment to draw students to a school with a winning football team. It is cultural. Those making those contributions believe it will make WMU more appealing. I understand where they are coming from. It is their way of making WMU great. They have the money to do it and it is their vision. In their way, they love WMU. Question (asked in the hallway after the meeting): What are your thoughts on the affiliation between WMU and Cooley Law School? The Board of Trustees thought it was a good idea. It was to expand the footprint of WMU and to be a good mutual relationship for both. Question (asked in the hallway after the meeting): Can you comment on the various business interests of members of the Board of Trustees and how these interests might intersect with their roles as trustees? I do not know enough to comment on it at this time. However, I will do research and get back to you with answers at a later date. Listening to the frustrations of faculty in the meeting, I had no idea what a conundrum existed between the faculty, deans, provost and the president. I knew a little, but the discussion at the chapter meeting opened my eyes! We have to find a way forward. If we do not regard our faculty and the educational experience, we will have failed. I want students to be mentored and faculty to fulfill their calling. We must find a better way. I believe that the way forward is talking and addressing these very hard issues. I do not have all the answers, but I believe we do. When I say we, I mean faculty, employees, administration, and the WMU Board of Trustees. We have to begin to build bridges and work toward a community of good. We have to work collectively and not pretend others do not exist. In regard to the placement of the WMU-AAUP and other unions on the WMU Board of Trustees agenda, I do not agree at all with the denial of the WMU-AAUP as an active partner in shared governance. There appears to be a desire to ignore the WMU-AAUP contract in regard to shared governance. I encourage the leadership to continue discussion with the President. I believe that this change to the agenda has more to do with being outspoken and advocacy for faculty then it has to do with anything. I believe it is a punitive and unfair action by the Board of Trustees.